Welcome to Saint Peter & Saint Paul Orthodox Church’s website! If you are a first-time visitor or long-time member, please take a few minutes to explore our site. You will find information on our parish’s activities and events, as well as several good resources for those curious about the Orthodox Faith. The Orthodox Church humbly, yet confidently professes to be the original Church of Christ, founded on the apostolic witness to our Lord, born on the Day of Pentecost, and for over 2,000 years making known to all nations the path to salvation through repentance and faith in Christ. Our parish family is dedicated to spreading the Good News throughout our local community and the world. Our members are made up of a variety of ethnic and social backgrounds, and our services are in English. We welcome all visitors, whether they are long-time Orthodox Christians, new converts, those rediscovering their faith after many years away or simply wanting to learn more about Orthodox Christianity. For more information on our parish, to schedule pastoral counseling, visitations, baptisms, weddings or other sacraments, or to inquire more about our faith, please contact Fr. Herman Kincaid. 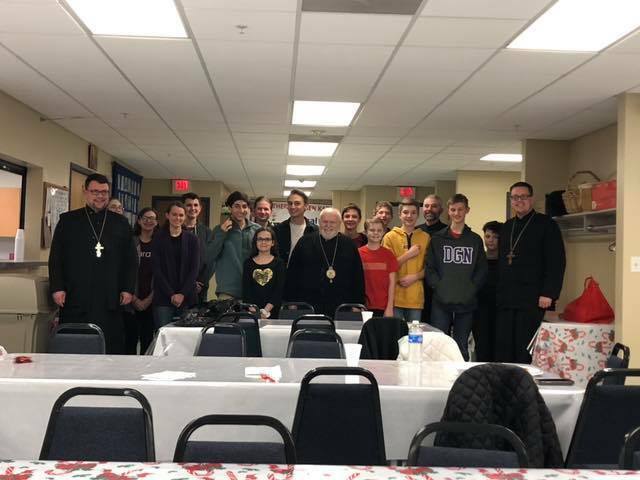 On January 4th, the youth groups from St. Luke Orthodox Church and St. Peter & St. Paul met for a pizza and game night. There were a total of 18 youth in attendance! The youth, as well as the clergy, had a surprise visit from His Grace, Bishop PAUL!